NexGard Spectra is supplied in the form of a chewable, beef-flavoured tablet to be given once per month to dogs. It controls fleas, ticks, heartworm and gastro-intestinal roundworms. This is a very wide range of major parasites to be controlled safely and effectively with simple once monthly dosing. For the full list of excipients, see Pharmaceutical particulars. Mottled red to reddish brown circular shaped (for dogs 2–3.5 kg) or rectangular shaped (for dogs >3.5–7.5 kg, >7.5–15 kg, >15–30 kg and >30‑60 kg) chewable tablets. For the treatment of flea and tick infestations in dogs when the concurrent prevention of heartworm disease (Dirofilaria immitis larvae), angiostrongylosis (reduction in level of immature adults (L5) and adults of Angiostrongylus vasorum) and/or treatment of gastrointestinal nematode infestations is indicated. Treatment of flea infestations (Ctenocephalides felis and C. canis) in dogs for 5 weeks. Treatment of tick infestations (Dermacentor reticulatus, Ixodes ricinus, Rhipicephalus sanguineus) in dogs for 4 weeks. Treatment of infestations with adult gastrointestinal nematodes of the following species: roundworms (Toxocara canis and Toxascaris leonina), hookworms (Ancylostoma caninum, Ancylostoma braziliense and Ancylostoma ceylanicum) and whipworm (Trichuris vulpis). Treatment of demodicosis (caused by Demodex canis). Treatment of sarcoptic mange (caused by Sarcoptes scabiei var. canis). Prevention of heartworm disease (Dirofilaria immitis larvae) with monthly administration. Prevention of angiostrongylosis (by reduction of the level of infection with immature adult (L5) and adult stages of Angiostrongylus vasorum) with monthly administration. Fleas and ticks need to start feeding on the host to become exposed to afoxolaner; therefore the risk of the transmission of vector-borne diseases cannot be excluded. Ancylostoma ceylanicum is reported as being endemic only in South-East Asia, China, India, Japan, some Pacific islands, Australia, the Arab Peninsula, South Africa and South America. Parasite resistance to any particular class of parasiticides may develop following the frequent, repeated use of a product of that class. Therefore, the use of this product should be based on the assessment of each individual case and on local epidemiological information about the current susceptibility of the target species in order to limit the possibility of a future selection for resistance. Maintenance of the efficacy of macrocyclic lactones is critical for Dirofilaria immitis control. To minimise the risk of resistance selection, it is recommended that dogs should be checked for both circulating antigens and blood microfilariae at the beginning of each season of preventative treatment. Only negative animals should be treated. In the absence of available data, treatment of puppies less than 8 weeks of age and dogs less than 2 kg bodyweight should be based on a benefit-risk assessment by the responsible veterinarian. In heartworm endemic areas, dogs should be tested for existing heartworm infestation prior to administration of NexGard Spectra. At the discretion of the veterinarian, infested dogs should be treated with an adulticide to remove adult heartworms. NexGard Spectra is not indicated for microfilariae clearance. The recommended dose should be strictly observed in collies or related breeds. In clinical studies, no serious adverse reactions were attributed to the combination of afoxolaner and milbemycin oxime. Adverse reactions such as vomiting, diarrhoea, lethargy, anorexia, and pruritus were uncommonly observed. These occurrences were generally self-limiting and of short duration. - very common (more than 1 in 10 animals treated displaying adverse reaction(s)). Laboratory studies in rats and rabbits have not produced any evidence of teratogenic effects, or any adverse effect on the reproductive capacity in males and females. Milbemycin oxime is a substrate for P-glycoprotein (P-gp) and therefore could interact with other P-gp substrates (for example, digoxin, doxorubicin) or other macrocyclic lactones. Therefore, concomitant treatment with other P-gp substrates could lead to enhanced toxicity. For dogs above 60 kg appropriate combinations of chewable tablets should be used. Method of administration: The tablets are chewable and palatable to most dogs. If the dog does not accept the tablets directly they may be administered with food. Treatment schedule: The treatment schedule should be based on veterinary diagnosis and on the local epidemiological situation. 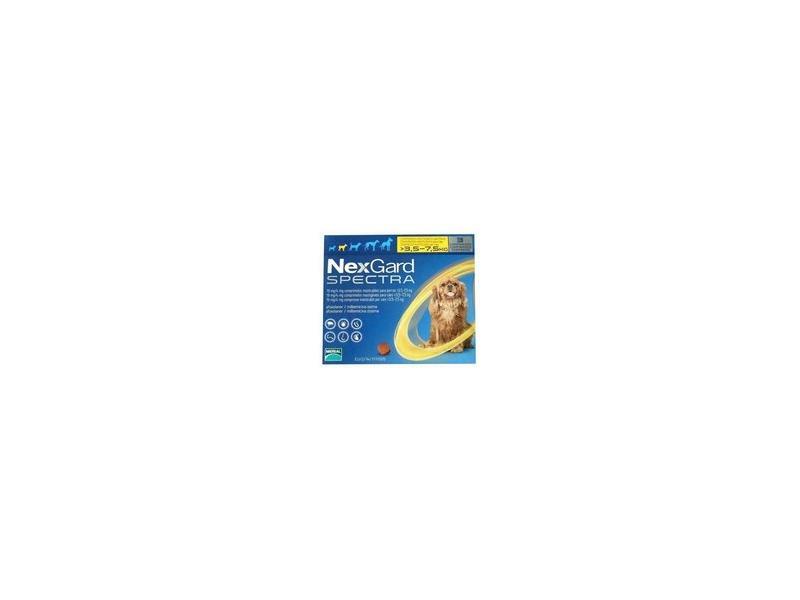 NexGard Spectra can be used as part of the seasonal treatment of fleas and ticks (replacing treatment with a monovalent flea and tick product) in dogs with diagnosed concurrent gastrointestinal nematode infestations. A single treatment is effective for the treatment of gastrointestinal nematodes. 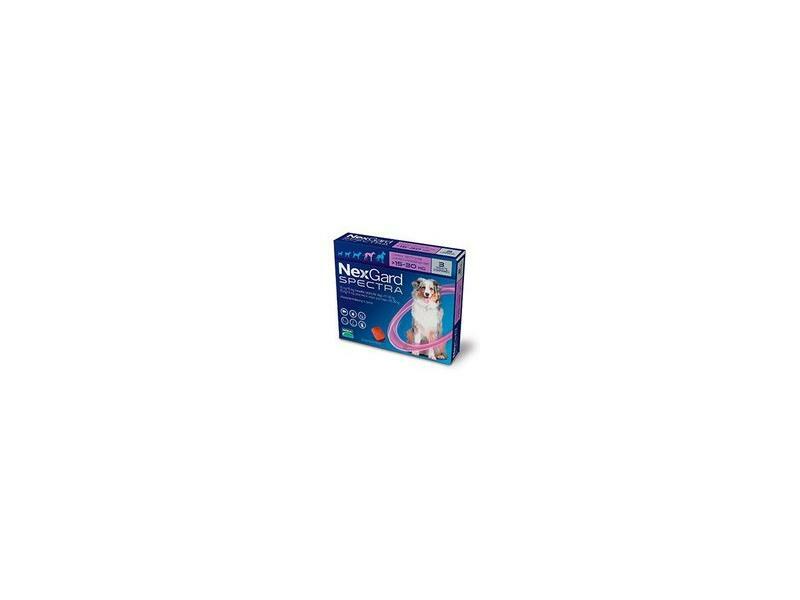 After treatment of the nematode infestations, further flea and tick treatment should be continued with a monovalent product. Monthly administration of the product until two negative skin scrapings are obtained one month apart. Severe cases may require prolonged monthly treatments. As demodicosis is a multi-factorial disease, where possible, it is advisable to also treat any underlying disease appropriately. Monthly administration of the product for two consecutive months. Further monthly administration of the product may be required based on clinical assessment and skin scrapings. NexGard Spectra kills Dirofilaria immitis larvae up to one month after their transmission by mosquitoes therefore the product should be administered at regular monthly intervals during the time of the year when vectors are present, starting in the month after the first expected exposure to mosquitoes. Treatment should continue until 1 month after the last exposure to mosquitoes. To establish a treatment routine, it is recommended that the same day or date be used each month. When replacing another heartworm preventative product in a heartworm prevention programme, the first treatment with NexGard Spectra should start on the date when the former medication was due to have been administered. Dogs living in heartworm endemic areas, or those which have travelled to endemic areas, may be infested with adult heartworms. No therapeutic effect against adult Dirofilaria immitis has been established. It is therefore recommended that all dogs 8 months of age or more, living in heartworm endemic areas, should be tested for existing adult heartworm infestation before being treated with the product for heartworm prevention. In endemic areas, monthly administration of the product will reduce the level of infection with immature adults (L5) and adults of Angiostrongylus vasorum in the heart and lungs. No adverse reactions were observed in eight-week old healthy puppies after 6 treatments at up to 5 times the maximum dose. Afoxolaner is an insecticide and acaricide of the isoxazoline family. Afoxolaner acts as an antagonist at ligand-gated chloride channels, in particular those gated by the neurotransmitter gamma-aminobutyric acid (GABA). Isoxazolines, among the chloride channel modulators, bind to a distinct and unique target site within the insect GABACls, thereby blocking pre- and post-synaptic transfer of chloride ions across cell membranes. Prolonged afoxolaner-induced hyperexcitation results in uncontrolled activity of the central nervous system and death of insects and acarines. The selective toxicity of afoxolaner between insects, acarines and mammals may be inferred by the differential sensitivity of the insects and acarines’ GABA receptors versus mammalian GABA receptors. It is active against adult fleas as well as against several tick species such as Rhipicephalus sanguineus, Dermacentor reticulatus and D. variabilis, Ixodes ricinus and I. scapularis, Amblyomma americanum, and Haemaphysalis longicornis. Afoxolaner kills fleas before egg production and therefore prevents the risk of household contamination. It can be used as part of a treatment strategy for the control of flea allergy dermatitis (FAD). Milbemycin oxime is an antiparasitic endectocide belonging to the group of macrocyclic lactones. Milbemycin oxime contains two major factors, A3 and A4 (ratio of 20:80 for A3:A4). It is a fermentation product of Streptomyces milbemycinicus. Milbemycin oxime acts by disrupting the glutamate neuro-transmission in invertebrates. Milbemycin oxime increases glutamate binding with consequent enhanced chloride ion flow into the cell. This leads to hyperpolarisation of the neuromuscular membrane resulting in paralysis and death of the parasites. Milbemycin oxime is active against several gastrointestinal worms (Toxocara canis, Toxascaris leonina, Ancylostoma caninum, Ancylostoma braziliense, Ancylostoma ceylanicum, Trichuris vulpis), the adults and immature adults (L5) of lungworm Angiostrongylus vasorum and heartworm (Dirofilaria immitis larvae). Maize starch, Soy protein, Braised beef flavouring, Povidone (E1201), Macrogol 400, Macrogol 4000, Macrogol 15 hydroxystearate, Glycerol (E422), Medium-chain triglycerides, Citric acid monohydrate (E330), Butyl-hydroxytoluene (E321). Shelf life of the product as packaged for sale: 2 years. Keep the blister in the outer carton in order to protect from light. The product is individually packaged in plastic blisters. One carton contains one blister of 1, 3 or 6 chewable tablets. Not all pack sizes may be marketed. Below are some recent questions we've received regarding NexGard Spectra, including answers from our team. Is it 2 in 1? My dog is 16,5 kg. Do I give him a chewable NexGard Spectra, instead of a pipette once a month and a Drontal once every 3 months? Yes this would be good, though theoretically you only need to give a Droncit, not a Drontal, every 3 months. (Droncit is just for tapeworms and that is all you need along with NexGard. 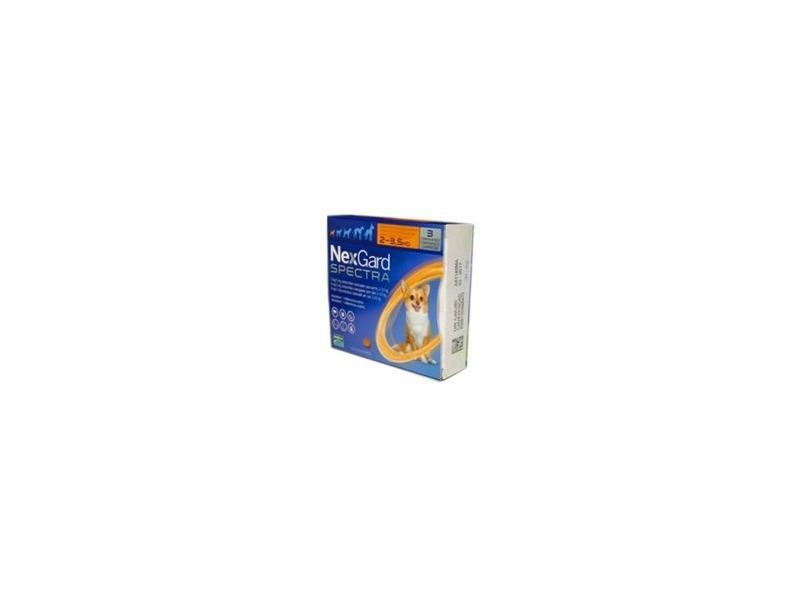 Drontal has an extra ingredient to control roundworms, which are covered by the NexGard anyway.) It would be safe enough either way, but ideally you avoid giving unnecessary medication.